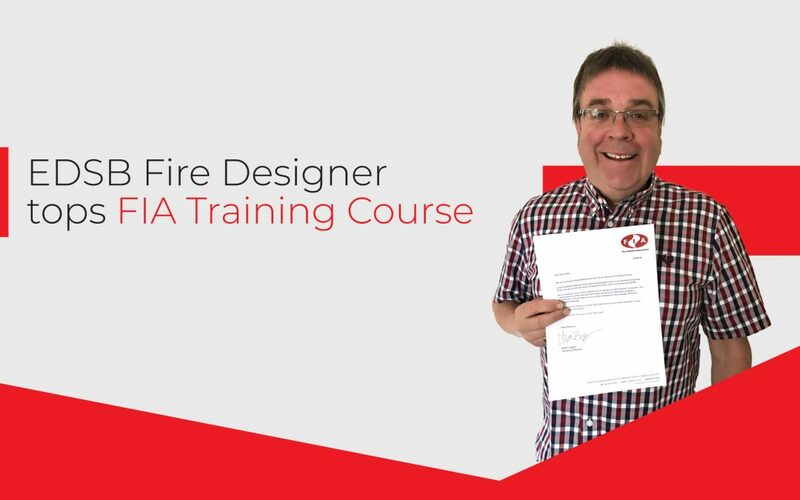 Designer Mick Wild, who recently completed the FIA AO Foundation in Fire Detection and Alarms, the first unit in the FIA’s new Qualification Pathway, which was introduced in January 2018 following the formation of a new formal examination body, the FIA Awarding Organisation, which is registered with Ofqual for the provision of vocational qualifications. Not only did Mick successfully pass his exam with a staggering 93.4%, he also topped the list for the highest pass rate on this qualification unit. A feat admired by both EDSB and the FIA, therefore we decided to ask Mick about his thoughts on the course. What did you think of the course in general? Overall, I thought that the course was very good, well thought out and delivered excellently to the attendees. What did you think about the quality of the trainer who gave the training? I thought he was very good; he certainly knew his stuff and would discuss any queries I had during the day, even in his lunch break! That’s refreshing. Have you learnt anything new that you will take with you into the field? I learnt quite a lot of new information during this course. The reg’s have changed quite a bit from previous 2002, 2013 reg’s and I am already using this new information now on a daily basis. What was the highlight of the course? Obviously it has to be my result in the exam, I was delighted to find out I had achieved over 93% and this is something I am extremely proud of, to hear it is possibly the highest score achieved makes me very happy. What advice would you give to someone thinking of doing the Foundation course? I think the course would prove very difficult to pass for a new person entering the industry as background knowledge was instrumental towards my recent success. However, for a fellow professional with a number of years experience, then it is great for bringing you up to speed with current regulations, legal information and laws within different parts of the UK. What makes FIA training and doing the qualification different/important to you? For me, once I have the qualification, I can list the result on my ECS card, it proves that I can do the job that I love doing on a daily basis. It is key to my role. There are 4 units in total to the FIA AO Level 3 qualifications in fire detection and alarm: Foundation in Fire Detection and Alarm; Health and Safety for Field Service Technicians; Environmental for Field Service Professionals; and then one option of four advanced specialist units (Advanced Designer, Advanced Installed, Advanced Maintainer, or Advanced Commissioner). Once all four units are passed successfully, a Level 3 vocational qualification is awarded by the FIA Awarding Organisation.